IAM Delta Flight Attendants, IAM represented ExpressJet and CommutAir Flight Attendants and United Fleet Service workers met with Senator Ted Cruz (R-TX) to convince the Texas Republican to support the FAA Reauthorization bill (From left to right: Brian Lasaine, United Fleet Service; Victor Hernandez, United Fleet Service; Victoria Daleo, IAM Delta Flight Attendant; Dave Roderick, United Fleet Service; Banetta Jones, ExpressJet Flight Attendant; Senator Ted Cruz; Sara Gonzales, ExpressJet Flight Attendant; Damion Thorpe, CommutAir Flight Attendant; Ali Rhodes, ExpressJet Flight Attendant; Alex Jenkins, IAM Delta Flight Attendant; Julianna Helminski, IAM Delta Flight Attendant). IAM Delta Flight Attendants this week joined IAM Flight Attendants and over 300 other IAM members in Washington DC for the 2018 IAM Legislative Conference, the largest political operation in the labor movement. IAM members visited hundreds of US Representatives and Senators and 10-hours rest for Flight Attendants was a top legislative priority for all IAM members and their sister and brother Delta Flight Attendants. 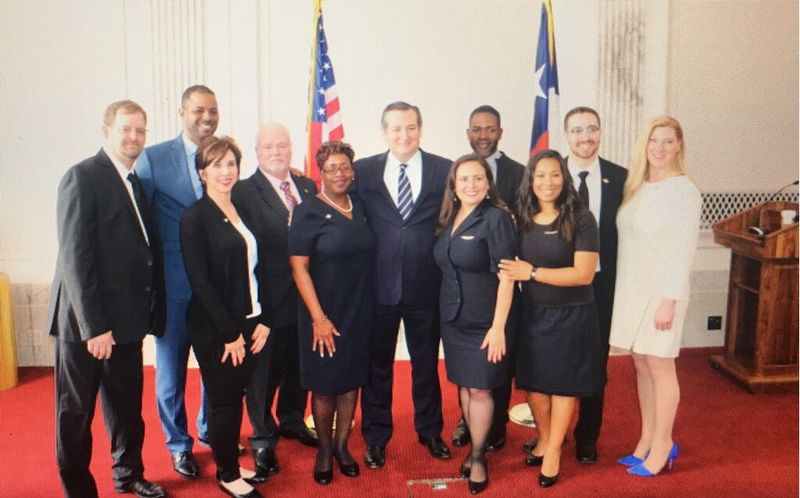 IAM Delta Flight Attendants personally met with Senator Elizabeth Warren (D-MA), Senator Ted Cruz (R-TX), US Representative Keith Ellison (D-MN) and attended a rally with Bernie Sanders in support of his Workplace Democracy Act. IAM Delta Flight Attendants Victoria Daleo, Julianna Helminski and Alex Jenkins teamed up with IAM members from ExpressJet, United Airlines, American Airlines, Southwest Airlines, Alaska Airlines, Hawaiian Airlines, Boeing and IAM members from many other sectors. The group lobbied Congress on legislation such as the FAA Reauthorization Bill, which includes the 10-hours rest provision for Flight Attendants, as well as other legislation that affects working people. The IAM holds its annual Legislative Conference each May. The IAM’s Legislative Department is the top legislative and political operation in the labor movement and advocates for laws and policies that benefit working families and has been on the forefront in fighting for and achieving policies that have improved Flight Attendant working conditions. Read more about the IAM Legislative Department and the 2018 Legislative Conference.